In the left panel of the WebSphere web console, expand Monitoring and Tuning > Performance Viewer, and select Current activity. Select the server that contains the application that you want to monitor. In this example, the Snoop Servlet of the Default Application was refreshed twice to generate some monitoring data. 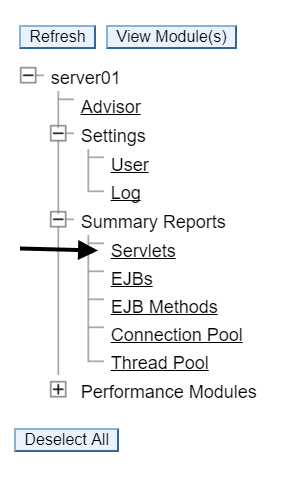 By default, the Servlets Summary Report is displayed. There are a number of other type of reports that can be displayed.